The Bank of Ceylon was conferred the Master Brand status for the year 2017- 2018 by the CMO Council Asia at the ceremony held at Taj Samudra Hotel Colombo recently. 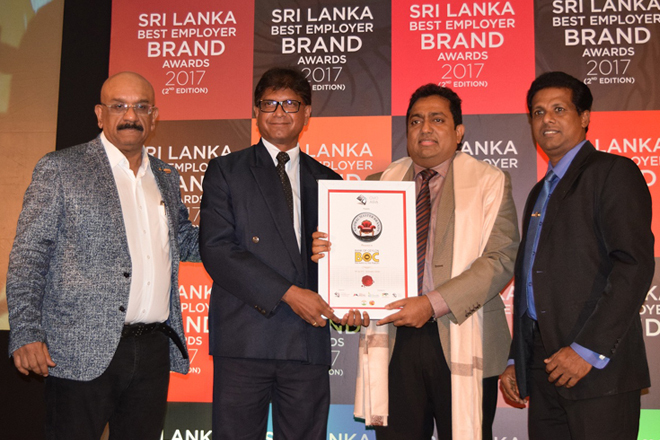 Being named as the No.1 brand in the country for over nine consecutive years by the Brand Finance Sri Lanka, the Bank of Ceylon currently holds the highest brand value in the country which is Rs.40 Billion. Since its inception, Bank of Ceylon’s motive has been the same –that is promoting social and economic development of the country and its people. As such BOC brand has been strategically adapting its products and services portfolio with a good understanding of future social and economic trends that requires tailor-made banking and financial services. It has been a trusted financial partner to clients for over 78 years and has reached extraordinary milestones such as surpassing Rs. One trillion assets in 2012, Rs.one trillion in deposits in 2015 and Rs.one trillion advances in 2016 as the first Sri Lankan bank to do so. The Bank’s asset value now exceeds Rs. 1.6 Trillions and is the highest asset base owned by a single business entity in the country. Currently the Bank of Ceylon is the only Sri Lankan bank to own “a trillion triplet” in the balance sheet. With the current outlook on the bank’s asset growth rate at 7% the Bank has planned to enhance its asset base up to Rs. 2 trillion by 2019-yet another milestone in the Sri Lankan banking industry. Such capabilities encompasses great responsibilities on the Bank of Ceylon to serve all stakeholders including its very diverse customer base from individuals to businesses and organizations from different geographic locationsand economic strata. The Bank’s approach to cater to the very dynamic banking needs of its customer base has been the key factor behind BOC brand’s 78-year-long success. With the time-tested vision as “Banker’s to the Nation”, brand BOC has delivered the best results for its true stakeholders, citizens and the Government of Sri Lanka as a state owned bank. As a state owned Bank, BOC’s contribution does not end simply on achieving financial performance. It plays a major role in financial inclusion, developing individuals from all walks of lives, Micro and SME entrepreneur development and developing large-scale corporate businesses. Working in line with the Government mandate to reach the unbanked population, and get youth and women engaged in development, the Bank of Ceylon took bold and conscious strategic decisions in invest on sustainable growth of these groups. Long term initiatives such as “branch on wheels”, and “Samata Ginumak” (an account to every citizen) campaigns were implemented to penetrate and infuse economic empowerment and enrichment in these segments together with sustainable growth with the bank. Further contributing towards the Bank’s inherent responsibility towards National Economic development, the Bank made a direct contribution towards the Government of Sri Lanka by way of significant payment of dividends and taxes in 2016, corresponding to its profit increase. This was a substantial growth in contribution made to the Government and highest made by a Sri Lankan business entity to the state. The ultimate benefits of the Bank’s contribution to the Government will cascade down to all citizens by means of Government economic and infrastructure development and welfare programs. Leveraging on the strength of the Bank’s balance sheet BOC was named as “the strongest bank in Sri Lanka for the year 2015 for its balance sheet growth, profitability, asset quality and liquidity by the “The Asian Banker”. At the 2015 National Business Excellence (NBEA) awards by the National Chamber of Commerce Sri Lanka, BOC earned a massive victory by winning the Over-all Gold award and becoming the winner in the categories of Banking sector, Excellence in CSR, Excellence in Local Market reach and Extra-large category and the runner-up of Excellence in Capacity building. This was awarded to recognize the Bank’s contribution to the socio economic development of the country through exemplary business practices. The Bank’s Annual Report 2015 won the “Best Presented Annual Report Award” in public sector Banking Institutions category winning 1st place in the SAARC Region at the South Asian Federation Accountants (SAFA) Awards Ceremony held in Dhaka Bangladesh. Focusing on the Banks achievement, Fitch Rating Lanka re-affirmed the Bank of Ceylon at AA+(lka) which is the highest rating awarded to a local commercial bank and ICRA (lk) awarded AAA rating which is the highest credit quality rating issued by ICRA Lanka.